Bytek Buys and Sells New, Refurbished and New HP Servers. 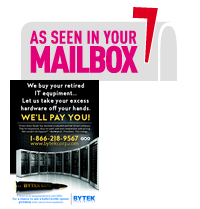 Save up to 70% or more when you purchase a refurbished HP server from Bytek! Sell your used HP Servers without time consuming hassles lengthy delays and endless emails. Receive your quote on used HP Servers immediately over the phone or use our fast quote link and one of our specialist will contact you today. Bytek also provides companies with the option to buy used, refurbished or new HP Servers. Lower costs are just the first advantage. Even as manufacturers lower prices due to the current economic conditions, customers can still save up to 70 percent or more over the cost of new equipment. Reliability – Most of our refurbished or used HP Servers are about two to three years old, and there has been the time needed to have all the kinks worked out of it. Performance– Due to the cost savings when purchasing refurbished or used HP Servers, users are able to purchase better equipment than they otherwise would be able to afford. Availability– There is always a large pool of like-new refurbished or used HP Servers readily available. When you order like-new refurbished or used HP Servers it is available immediately. When purchased new, most servers and other equipment have to be built, which can delay the implementation of a project.